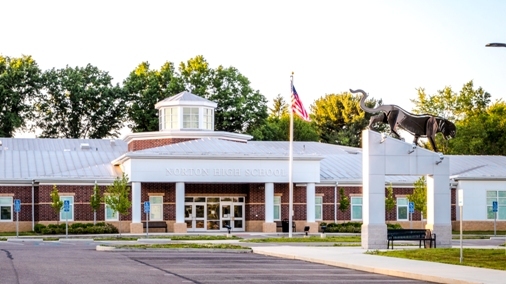 Norton High School serves nearly 750 students in grades nine through twelve. A medium sized suburban school, NHS offers a challenging course of study including advance placement courses, special needs programs, career-technical education (via the Four Cities Educational Compact with Barberton, Copley-Fairlawn, and Wadsworth), and a variety of extra-curricular and co-curricular activities, all of which is designed to meet the needs and interests of all Norton students. Continually in the pursuit of excellence, Norton High School has earned the rating of "Excellent" by the Ohio Department of Education. To inspire life-long learning in a caring, safe environment, through challenging educational experiences for every child every day. With our White and Red. 'Til we reach our goal.